I cannot tell you how much I love this cover. For reasons both good and bad, How To Suppress Women’s Writing by Joanna Russ reads like it could have been written yesterday. Actually, the book is older than me—published in 1983—but Russ’ smirking, clear-eyed perspective is still relevant. How To Suppress Women’s Writing investigates historical and social reasons that may have kept whole generations of women from writing in the first place (things like differential rates of literacy, disparate access to education, women’s historical lack of leisure time and position as wife as a second work shift). She also interrogates how it is that when women somehow do manage to write that women’s writing is ignored, slandered or undercut. The book was published by the University of Texas Press, which puts it squarely in the realm of academic works, but the writing is colloquial and accessible throughout. You do not need to be steeped in literary criticism or feminist theory to read and understand Russ’ arguments here, which is a great strength*. She argues that what is considered “good” or “worthy” literature (and by extension, that which is taught and thus survives across generations) is designated as such by privileged groups who have a vested interest in keeping themselves privileged. The ways in which they limit entrance or access to literature are by mental acrobatics such as assuming women writers didn’t really write their works, or that it doesn’t matter if they wrote it because it’s the wrong kind of work, or that maybe they wrote it and maybe it’s good but it’s the only good thing she ever wrote. Some of this is deliberate, but just as much is unconscious bias. Each chapter is broken into one tactic that has been used to suppress women’s writing, and Russ packs her chapters full of anecdotes, survey results, and historical examples to support her claims. And, somehow, she does it with a wry and witty voice that makes the writing lively. Still, the book is not a perfect one. It’s centered very squarely on white middle class women’s experiences. Russ occasionally throws in an anecdote about her friend and colleague, Samuel Delany, a Black scifi writer, but he himself is tokenized in the doing. Clearly throughout the text she attempts to draw parallels between gendered exclusions in literary circles and race-based exclusions, but Delany pops up over and over again as if he is the only Black writer she knows (and as if Black writers are the only voices who can counterpart the voices of white writers). White lesbian authors pop up far more frequently than writers of color, and women writers of color are virtually never mentioned in the main body of the text. This lack of intersectional focus irked me while I read it—it’s such a good book, and also such a clear example of the failings of second wave feminism. Russ uses the Afterword to acknowledge her failing here, directly addressing her unfamiliarity with and inability to capture the struggles of women writers of color. She talks about stumbling across a beautiful, rich treasure trove of writing by women of color—a parallel canon, as it were—which unintentional struck me as fetishizing and exoticizing of women of color’s experiences. That said, her idea of a parallel literary tradition is what resonated with me most. The book is predicated on the idea that the established canon should include more women, which yes, it should. But underlying that idea is an assumption that women writers should want to be part of that canon, which I’m not entirely sure is the case for all women writers, or all marginalized writers more broadly. This, again, strikes me as a distinctly white middle class second-wave feminist reaction: when barred entry break through the bars. Personally, when I am turned away from something I return to my community and make a safe space there (be that along class lines, lines of gender or lines of sexuality). I am more interested in creating and participating in alternative literary traditions, exploring what the limits of queer or working class or trans* writing can be, than gaining approval of wealthy cis straight white men. I’m pretty much done trying to impress wealthy cis straight white men. In 2011, VS Naipul received the Nobel prize for literature and used that platform to claim that no woman writer has ever been his literary match. And this past year, SFWA dealt with a massive gender catastrophe. Women writers are still encouraged to use gender neutral pen names due to claims that readers are less likely to pick up a book written by a woman. Recent counts and survey show that high-profile literary outlets still disproportionately publish work by men and disproportionately review work by men compared to women. Women writers still report struggling to access the time and space needed to write compared to men, feeling constrained by what Russ terms false categorizations, and report outright prejudice in the publishing industry. Women’s lives are the buried truth about men’s lives. The lives of people of color are the buried truth about white lives. The buried truth about the rich is who they take their money from and how. The buried truth about “normal” sexuality is how one kind of sexual expression has been made privileged, and what kinds of unearned virtues and terrors this distinction serves. 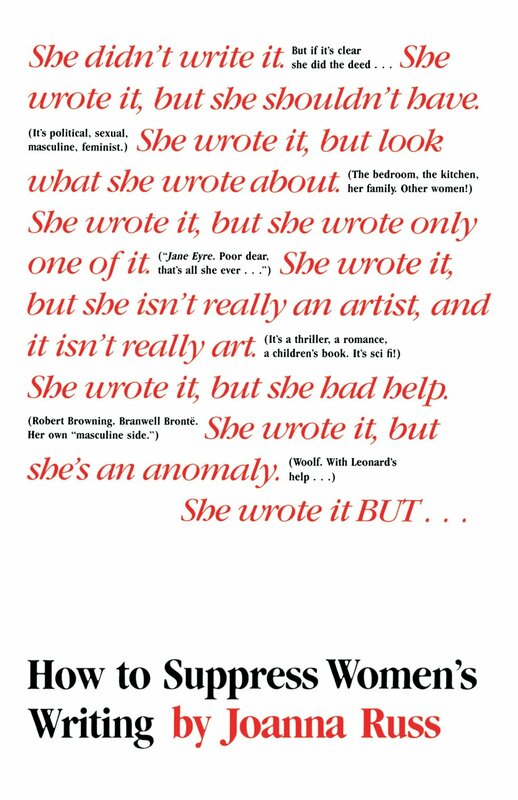 *Russ points out in the book that “women always write in the vernacular” and that this difference in language is one way that women’s writing has been historically devalued. The same can be said of the less-educated and working class—a consistent criticism I have and have heard about academia is that it uses language as a barrier to entry and as a membership check. That is, academia trains you to use words like reify and polemic and semiotic and in the doing makes your work utterly unintelligible to people without higher degrees. As someone whose work in graduate school was explicitly focused on class identity, this was a tension I ran into over and over again: how to communicate with the groups I want to communicate with given the resources I suddenly received without speaking “too low” to my adviser and “too school” for my friends and family. This entry was posted in 4 stars, Book Review and tagged feminism, food for thought, how to suppress women's writing, joanna russ, social justice, women writers, writers by brsanders. Bookmark the permalink.